This exercise demonstrates some of the advanced and exciting opportunities for model calibration and uncertainty analysis using PEST in Visual MODFLOW Flex. 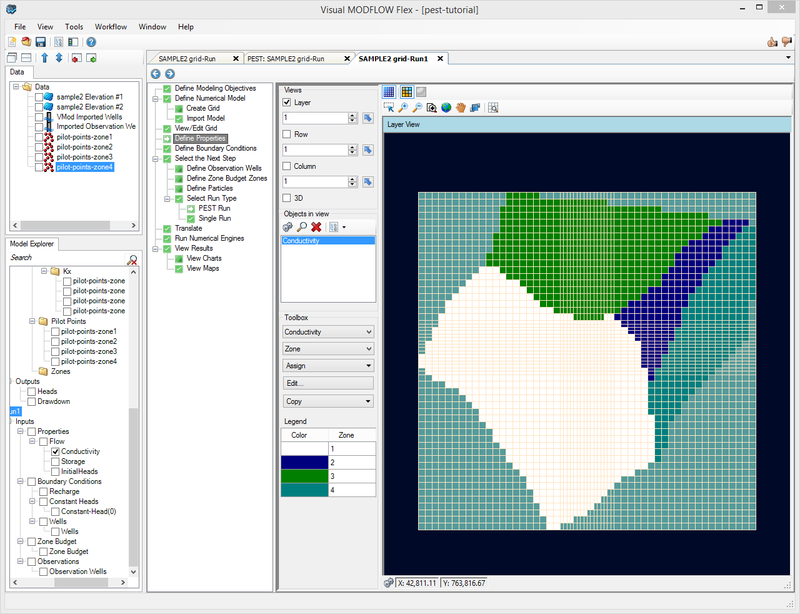 This exercise is based on the problem described in "Using Pilot Points to Calibrate a MODFLOW/MT3D Model", by John Doherty (Watermark Numerical Computing), and has been adjusted to work with the PEST workflow inside Visual MODFLOW Flex. You are encouraged to familiarize yourself with the concepts and applications of PEST prior to using in Visual MODFLOW Flex. 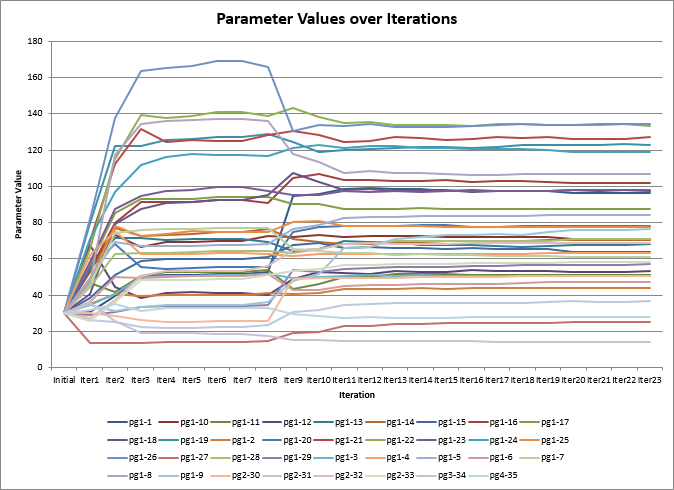 The time spent on this will make your experience with parameter estimation much more productive, and will likely help you to overcome any difficulties you may experience the first time you run PEST. In addition, if you are not familiar with the Visual MODFLOW Flex graphical environment, please take a few minutes to review the Program Overview section. 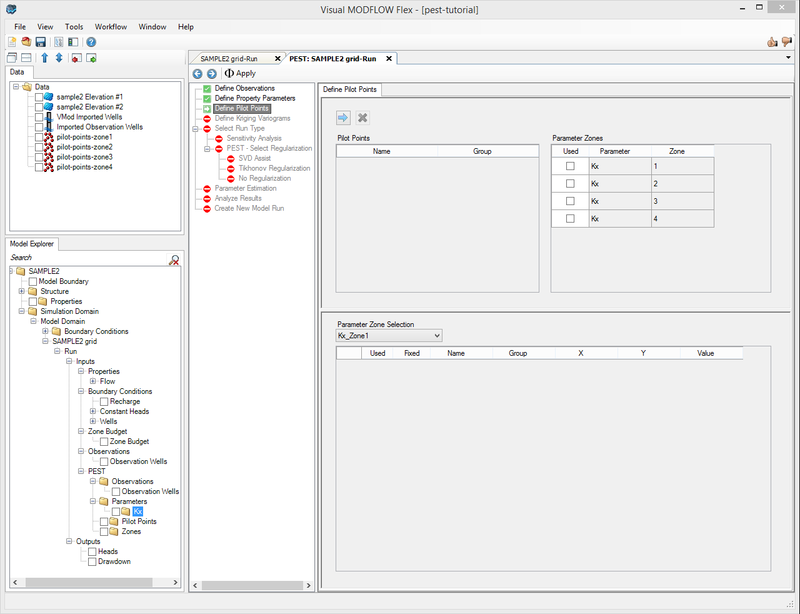 You must have a Pro or Premium license in order to use the PEST module in Visual MODFLOW Flex. Several files are required for this exercise, which should be included with the Visual MODFLOW Flex installation. If you cannot find these files, please download the PEST Tutorial project from our website, and unzip to a desired folder on your computer. •If you're not already on this step, click on the 'Select Run Type' in the numerical workflow tree. 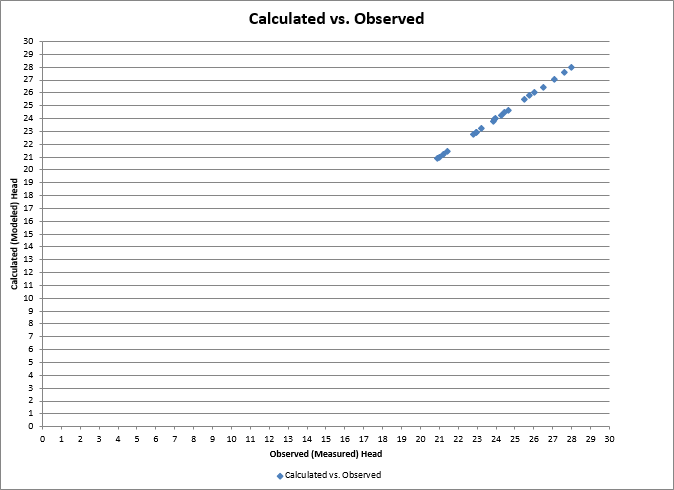 •The first step is to define the observations you want to include for calculating the objective function, and assign weights to various observations. •In this example, there are 21 observation wells where heads were measured at several intervals. •All head locations and associated time varying heads are selected by default, and will be used with a default weight = 1. •Click [ ] (Next Step) to proceed to the 'Define Property Parameters' step. •At this step, select which parameters you want to include in the PEST run. •In the table at the bottom, for each property zone, you must specify minimum and maximum values; defaults are provided. •In addition, the value from each zone is also displayed to assist in defining reasonable minimum/maximums. •Enter 300 for the Maximum for each zone. •Click [ ] (Next Step) to proceed to the 'Define Pilot Points' step. •Click [ ] (Insert button) at the top of the 'Define Pilot Points' window to add these points. 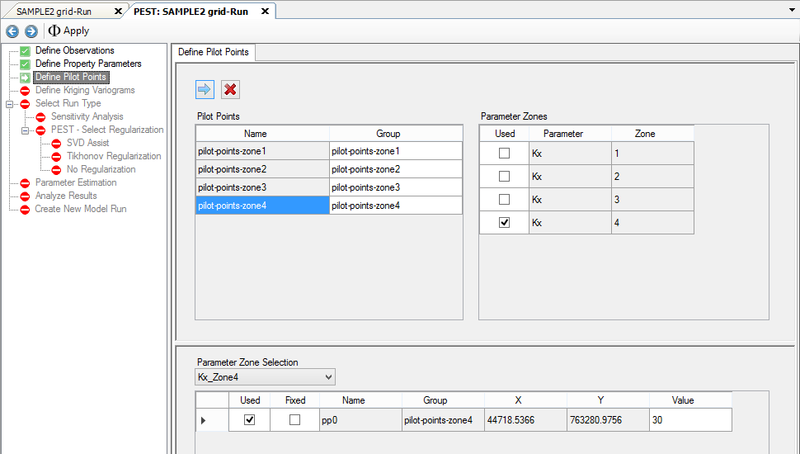 •Select which parameter zones the points represent under the Parameter Zones grid in the upper right section of the window. •When you are finished, your display should appear similar to the figure below. In the table at the bottom of the window, you can adjust some parameters for specific pilot points. The main use of this table is to specify which pilot points (if any) are Fixed (Hard) and their initial values. Fixed pilot points are those locations where you are confident in the measured parameter value (eg. pumping/slug test locations), and you want these values to remain Fixed during the PEST run. Above this table, there is a combo box where you select which parameter zone should be shown. 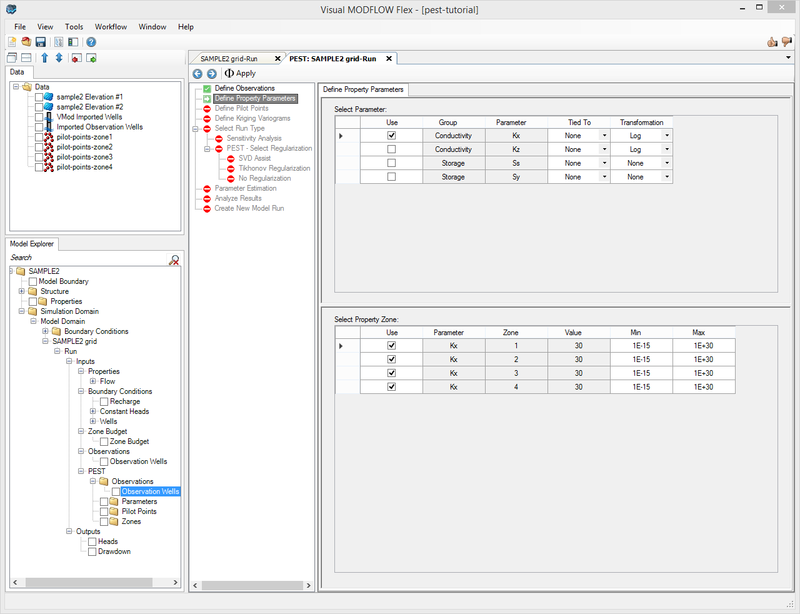 VMOD Flex allows you to combine multiple pilot point sets (eg. hard/soft) for parameter zones. In this example, leave the defaults as is. 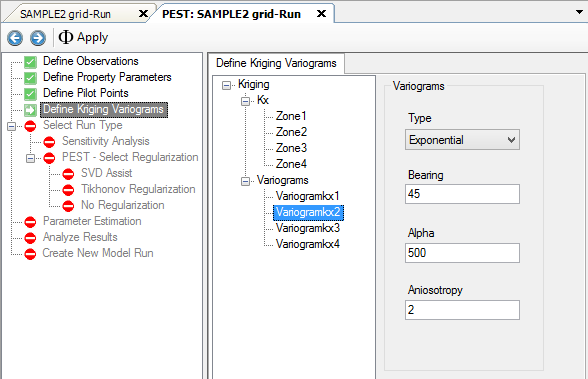 •Click [ ] (Next Step) to proceed to the Define Kriging Variograms. The use of pilot points in characterizing the spatial distribution of a hydraulic property must be accompanied by a mechanism whereby hydraulic property values assigned to pilot points are spatially interpolated to the cells of the finite difference grid. 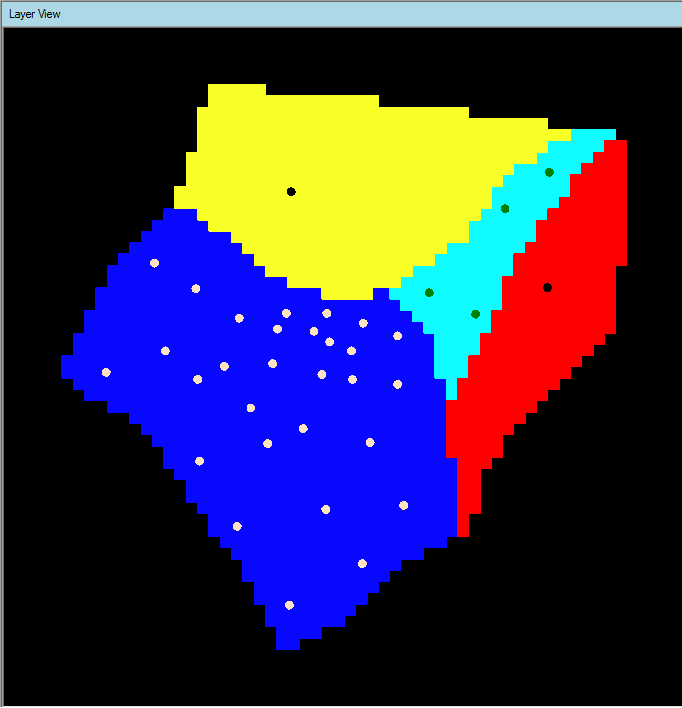 Spatial interpolation is accomplished using the Kriging algorithm. Kriging is a method of spatial interpolation based on geostatistics. The cornerstone of geostatistics is the variogram. A variogram describes the extent to which hydraulic property values (or any other type of data) pertaining to any two points are likely to be different from each other as a function of the distance between those points. One of the benefits of using Kriging as a basis for spatial interpolation is that the factors by which hydraulic properties at pilot points are multiplied before summation to obtain the hydraulic property value at a particular grid cell are independent of the actual hydraulic property values at the pilot points. Hence a set of “Kriging factors” pertaining to each of the cells of the finite difference grid can be calculated in advance of the actual interpolation process.Since the interpolation process is undertaken again and again as the model is run repeatedly by PEST, the fact that it is not necessary to repeat calculation of the Kriging factors on each occasion that the model is run can result in large savings in the time required to complete the overall parameter estimation process. Each zone is represented by a geostatistical structure. Each of these structures cites one variogram (though it could cite up to five). “Structure1” will be used to characterize zone 1 of our model domain (i.e. the river alluvium), “Structure2” will be used to characterize zone 2 (ie. the creek alluvium) whereas “Structure3” will be used to characterize zones 3 and 4. 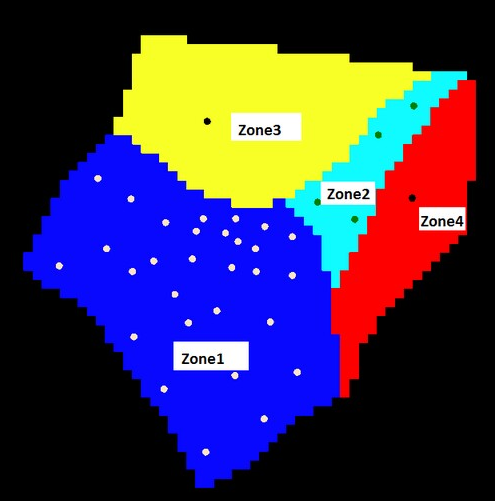 Note that the variogram assigned to these latter zones is quite unimportant; because there is only one pilot point assigned to each of them, all cells within these zones will be assigned the one interpolated value (same as the respective pilot point) irrespective of the variogram. 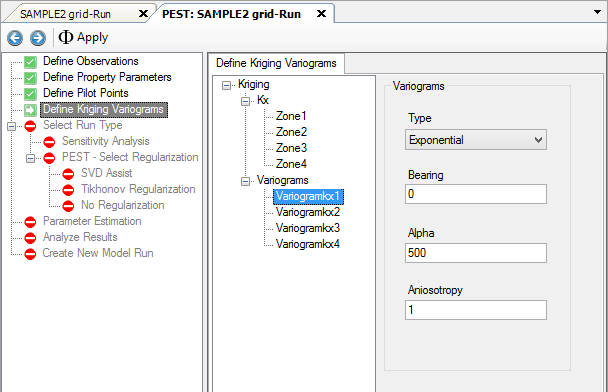 In VMOD Flex, a default variogram is generated for each parameter zone, with type 2 (Exponential). However, the structures should be modified. •In the editor on the right side of the display, for 'Transform', set this to log. •Repeat these steps, setting log 'Transform' for Kx in Zones 2, 3, and 4. Thus any variogram cited in each of these structures must pertain to the spatial distribution of the logarithm of the pertinent hydraulic property. This is in accordance with the fact that most studies cited in the groundwater literature which treat transmissivity and/or hydraulic conductivity as a regionalized variable indicate that its distribution is better described by a log variogram than by a variogram based on native property values. For this example, the default parameters for the variograms (all will use Exponential) is sufficient. However, for Zone2, we will define a value of 2.0 for the Anisotropy, with the direction of anisotropy coinciding with the direction of the creek. Alignment in the direction of the creek is based on the premise that channel structures within this old creek valley will make it more likely for hydraulic property similarity to prevail in this direction than in a direction at right angles to it. 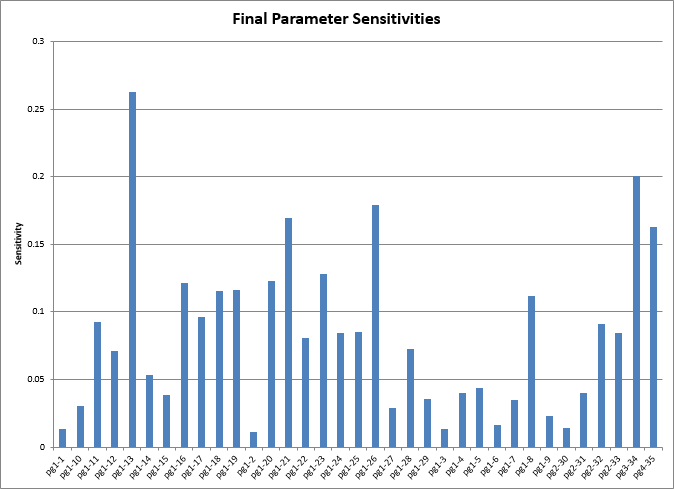 The variogram parameters can be adjusted by selecting a Variogram from the tree as shown below. •Click 'Variogramkx2' under the Variograms node in the tree. •Enter 2 for the 'Anisotropy'. •Enter 45 for the 'Bearing'. This value allows you to make the variogram anisotropic in a certain direction; 'Bearing' is an angle of rotation. •Click [ ] (Next Step) to proceed to the Select Run Type. At this step, choose the type of PEST Run. 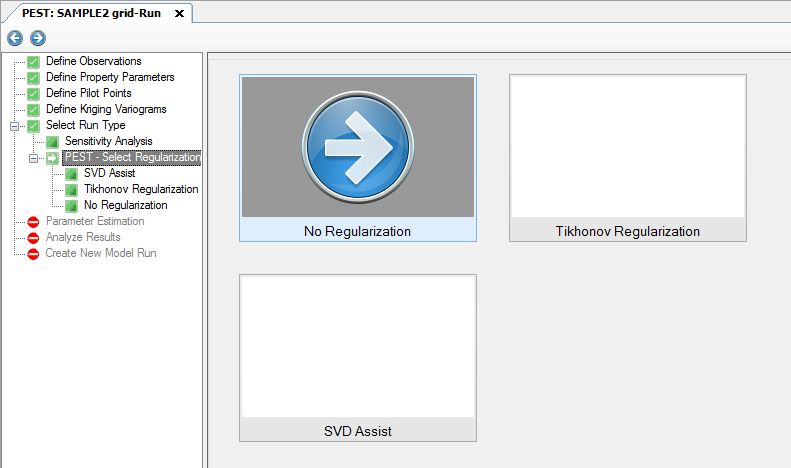 If you want to run PEST, then some additional options will be needed, such as define regularization and adjust the PEST control file. If you want to run Sensitivity Analysis, this can also be launched. •Click the [Parameter Estimation] button from the main window, as shown above. •The next step will be to choose the Regularization options. At this step, you can choose the type of Regularization to run. Regularization is a process whereby additional information is introduced into the objective function of the model in the form of ‘prior information equations’. These prior information equations can take many forms. Tikhonov Regularization can induce PEST to prefer a more homogeneous solution (i.e. pilot points that are near one another should have similar values) or Tikhonov Regularization can induce PEST to prefer parameter values which are as close to their initial values as possible. The Tikhonov regularization method adds more information to the overall problem, but the additional information helps to guide PEST toward acceptable parameter estimates as informed by your knowledge of the modeled area and to avoid ‘overfitting’ solutions. Another method of regularization supported in Visual MODFLOW Flex is singular value decomposition (SVD) regularization. The SVD process achieves numerical stability by subtracting parameters and/or combinations of parameters from the calibration process. As a result of the subtraction, the calibration process is no longer required to estimate either individual parameters or combinations of correlated parameters that are inestimable on the basis of the calibration dataset. These combinations are automatically determined through singular value decomposition (SVD) of the weighted Jacobian matrix. For this exercise we will not perform any regularization. •The next step will be to adjust the PEST control file. The last step before running PEST is to view and adjust the PEST Control file. For this exercise, the default values are fine. Before starting the PEST Run, it is a good idea to check the PEST Input files. PEST provides a utility to do this, called PESTCheck. •You should receive a confirmation that no errors were found. •Click [ ] (Next Step) to proceed to the Run PEST window. •Click [ ] (Run PEST) to start the PEST Run. The pest.exe will load in a DOS command window, and show the progress as seen below. Depending on the speed of your computer, the PEST run should take between 3-5 minutes. 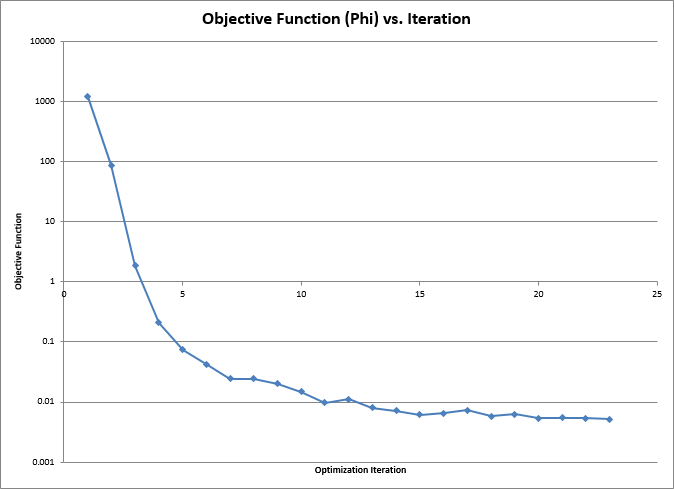 As PEST runs, you should see the objective function (phi) decreasing over each optimization iteration; pay attention to these values in the DOS window. 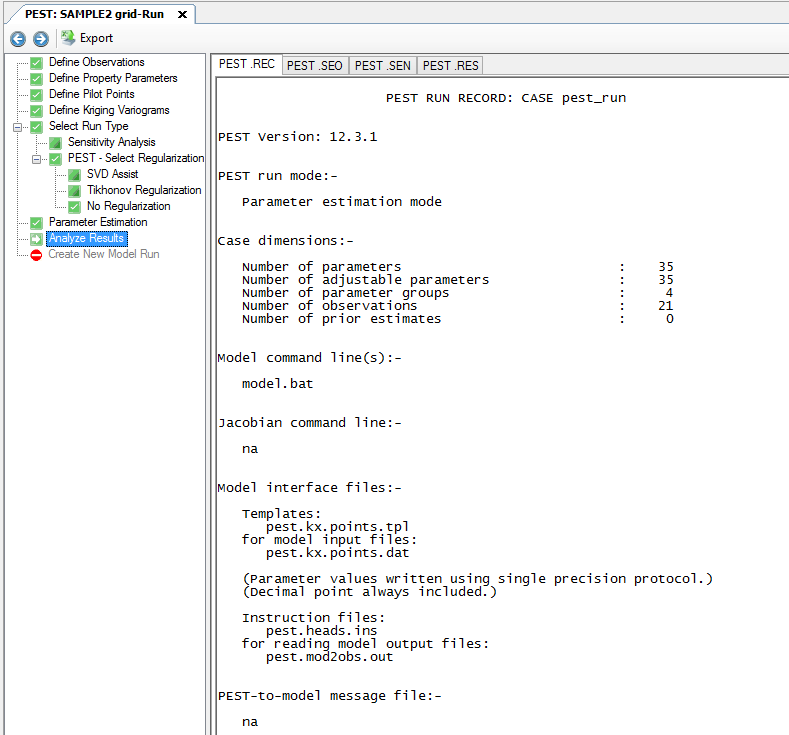 PEST will run a total of 25 optimization iterations and a total of 1366 model runs. PEST should reach a final objective function (phi) value of approximately 2.06 E-02. When PEST finishes, you should see a confirmation message in the main window, below the 'PEST Run Log' tab, as shown below. After the PEST run completes, you can analyze the results. •Click [ ] (Next Step) to proceed to the 'Analyze Results' step. 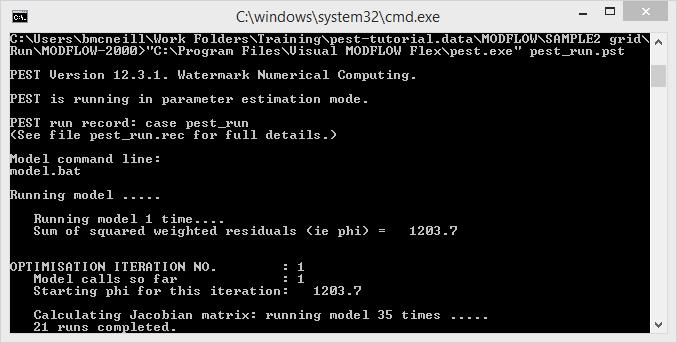 VMOD Flex presents the results of the PEST run, with one tab per output file. •Record file (.REC): contains parameter values, objective function, sensitivities, etc.. The results from these files can be exported into Excel for charting. •Click [ ] to export the PEST results to an Excel spreadsheet. A window will appear which allows you to select the location of the exported Excel spreadsheet, and to select from available templates. 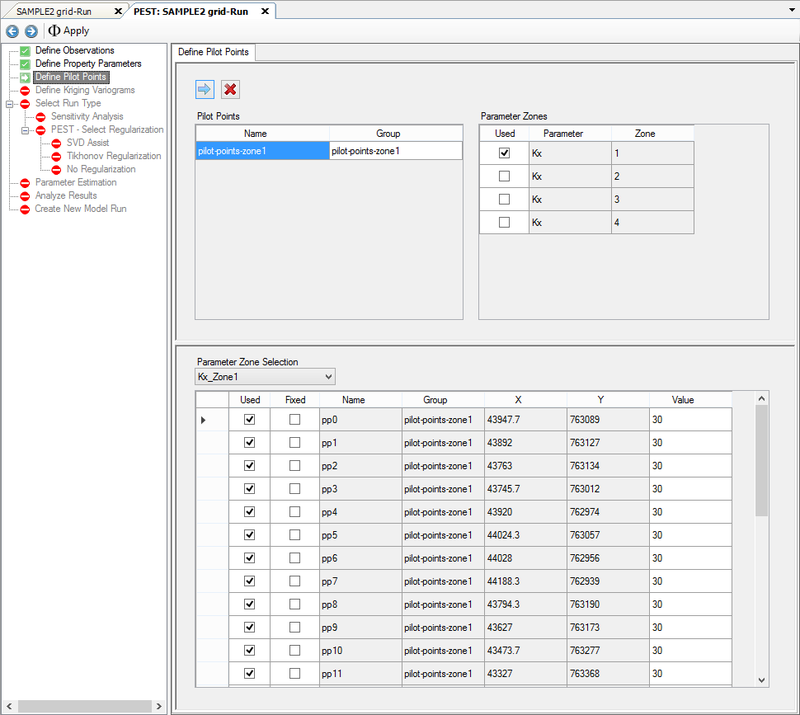 Two templates are available; one which will export the available PEST data to a series of worksheets/tables, and a 2nd template which will also generate a number of charts for each type of PEST data. An Excel spreadsheet will open which summarizes the results of the PEST run. Several data tables and charts are included; spend a few minutes reviewing them. The screenshots below display a small selection of the available PEST data. For more information about the PEST results please visit the PEST website (link provided at beginning of this tutorial). If the results look reasonable, you can save the adjusted Kx parameter zonation as inputs for a new model; this is explained in the next section. •Click [ ] (Next Step) to proceed. 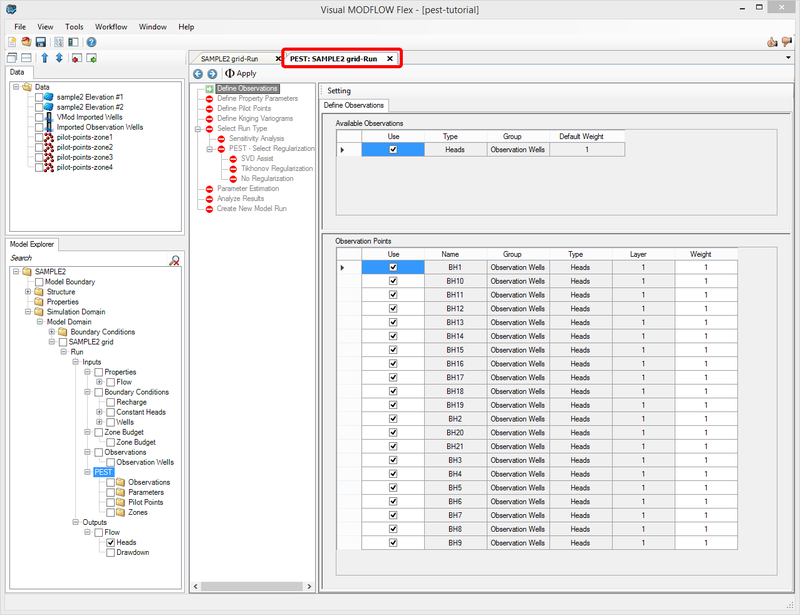 After reviewing the PEST output, if the adjusted parameter values seem reasonable, you can save these parameters as inputs for a new model run. •Click on the [Create New Model Run with PEST Results] button. 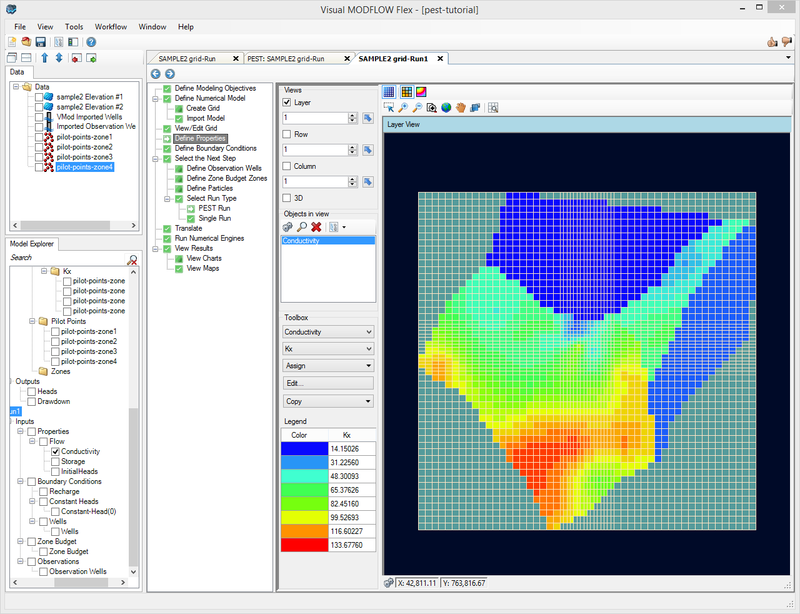 VMOD Flex will save the adjusted model parameters in a new model run within the same project. This new model run will appear in the Model Explorer below the most recent model run. 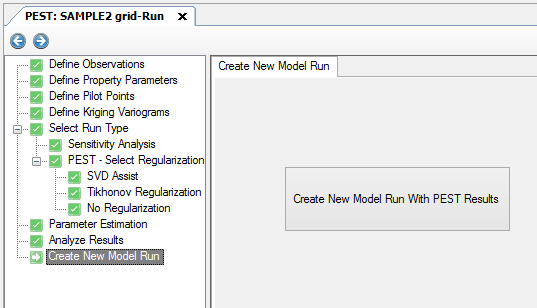 A new workflow window will also appear with this model run. •From the Toolbox, select 'Kx' as shown below; you should then see a color flood of the Kx values. You can mouse over the 2D display to see the range of Kx values. Click on the [ ] button on the toolbar to show color shading with contour lines. 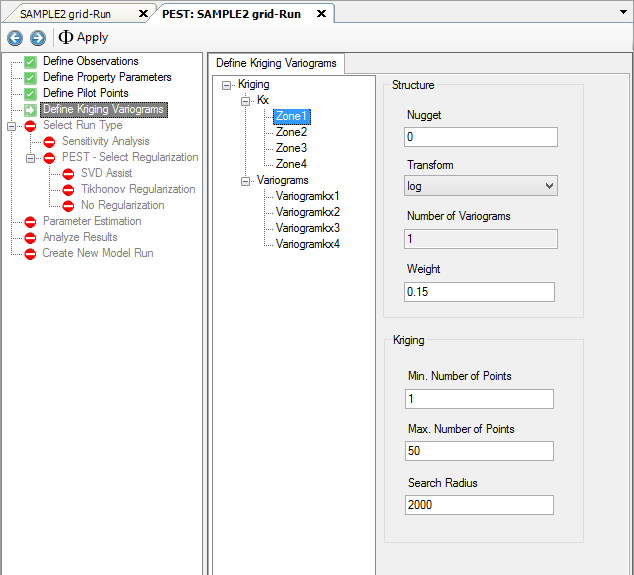 You must Translate and Run this new model run in order to see the updated MODFLOW results using the adjusted Kx parameters from PEST.